The government of European country A launches what it calls an‘anti-terrorist’ military operation against ‘separatists’ in one part of the country. 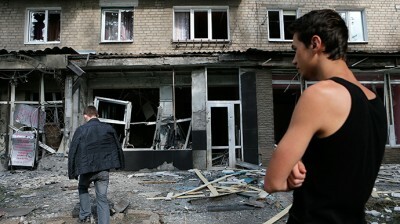 We see pictures on Western television of people’s homes being shelled and lots of people fleeing. The US and UK and other NATO powers fiercely condemn the actions of the government of country A and accuse it of carrying out ‘genocide’ and ’ethnic cleansing’ and say that there is an urgent ‘humanitarian crisis.’Western politicians and establishment journalists tell us that ‘something must be done.’ And something is done: NATO launches a ‘humanitarian’ military intervention to stop the government of country A. Country A is bombed for 78 days and nights. The country’s leader (who is labeled ‘The New Hitler’) is indicted for war crimes – and is later arrested and sent in an RAF plane to stand trial for war crimes at The Hague, where he dies, un-convicted, in his prison cell. The government of European country B launches what it calls an ‘anti-terrorist’ military operation against ‘separatists’ in one part of the country. Western television doesn’t show pictures or at least not many) of people’s homes being shelled and people fleeing, although other television stations do. But here the US, UK and other NATO powers do not condemn the government, or accuse it of committing‘genocide’ or ‘ethnic cleansing.’ Western politicians and establishment journalists do not tell us that‘something must be done’ to stop the government of country B killing people. On the contrary, the same powers who supported action against country A, support the military offensive of the government in country B. The leader of country B is not indicted for war crimes, nor is he labeled ‘The New Hitler’despite the support the government has got from far-right, extreme nationalist groups, but in fact, receives generous amounts of aid. 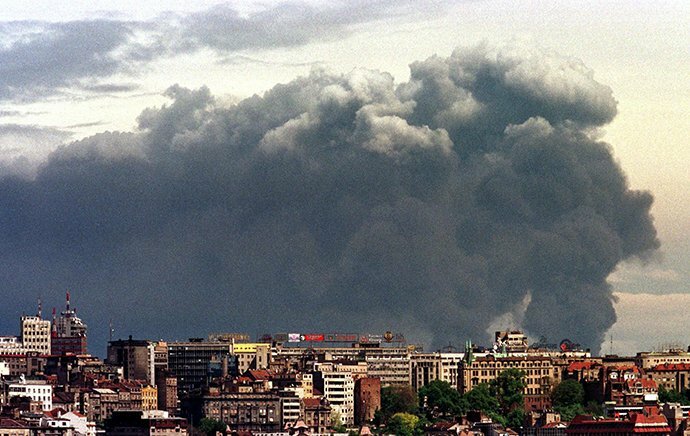 In 1998/9 Yugoslavian authorities were faced with a campaign of violence against Yugoslav state officials by the pro-separatist and Western-backed Kosovan Liberation Army (KLA). The Yugoslav government responded by trying to defeat the KLA militarily, but their claims to be fighting against’terrorism’ were haughtily dismissed by Western leaders. As the British Defence Secretary George Robertson and Foreign Secretary Robin Cook acknowledged in the period from 1998 to January 1999, the KLA had been responsible for more deaths in Kosovo than the Yugoslav authorities had been. The convoy we are told is ‘controversial’ and could be part of a sinister plot by Russia to invade. This from the same people who supported a NATO bombing campaign on a sovereign state for“humanitarian” reasons fifteen years ago! There are, of course, other conflicts which also highlight Western double standards towards‘humanitarian intervention’. Israeli forces have killed over 2,000 Palestinians in their latest ruthless ‘anti-terrorist’ operation in Gaza, which is far more people than Yugoslav forces had killed in Kosovo by the time of the 1999 NATO ‘intervention’. But there are no calls at this time for a NATO bombing campaign against Israel. In fact, neocons and faux-left Zionists who have defended and supported Israel’s “anti-terrorist”Operation Protective Edge, and Operation Cast Lead before it, were among the most enthusiastic supporters of the NATO bombing of Yugoslavia. Israel it seems is allowed to kill large numbers of people, including women and children, in its “anti-terrorist” campaigns, but Yugoslavia had no such“right” to fight an “anti-terrorist” campaign on its own soil. This explains why an ‘anti-terrorist’ campaign waged by the Yugoslav government against ‘separatists’in 1999 is ‘rewarded’ with fierce condemnation, a 78-day bombing campaign, and the indictment of its leader for war crimes, while a government waging an ‘anti-terrorist’ campaign against ‘separatists’ in Ukraine in 2014, is given carte blanche to carry on killing. In the end, it’s not about how many innocent people you kill, or how reprehensible your actions are, but about whose interests you serve.